The government and ruling party agreed Monday to reassess costs of nuclear power to include some intangible expenses that have been overlooked in a move to again stress that a shift from nuclear energy is the right way for the country's future energy policy. Officials from the trade ministry and the Democratic Party held a meeting earlier in the day to discuss plans over the nuclear-free energy initiative, one of the key pledges by President Moon Jae-in. 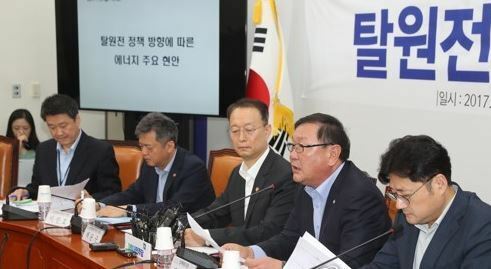 They exchanged ideas on the ongoing row over the two nuclear reactors awaiting a decision from a panel made up of some 350 citizens on whether to resume its now-suspended construction in Ulsan, 414 kilometers southeast of Seoul. The halt was made last month in line with the president's pursuit of a departure from nuclear power, triggering protest from its workers on the verge of losing their jobs. Experts and advocates of nuclear energy have expressed concern that it could lead to a hefty rise in electricity prices and a potential energy shortage. In a bid to quell such concerns, the government and ruling party said they will recalculate the cost for nuclear power production, including social and environmental costs. "Nuclear power is never less expensive, considering the potential safety risks from the disposal of nuclear waste. Those who say it's economical are not taking this into account," Rep. Kim Tae-nyeon said. "It's also not fair to compare the cost based on current prices as the costs for renewable energy are declining." Paik Un-gyu, the minister for trade, industry and energy, promised to shore up efforts to disclose the right information to the public so as to reduce any misunderstanding about the planned phased abandonment of nuclear power.